Based on Visual Studio user experience, one would think running unit tests for Windows Store apps is not all that different from running standard .NET framework unit tests using MSTest testing framework. When you try running them on a build server, it turns out there are a lot of differences. I'll describe them with a series of error messages and the corresponding changes that were required to resolve them. My starting point was a build step based on Visual Studio Tests runner using MSTest engine type, pointing to the assembly containing test (identical configuration can be used for running .NET framework unit tests). MSTest.exe doesn't recognize Windows Store unit tests; vstest.console.exe test runner must be used instead. In TeamCity this means VSTest must be chosen as Test engine type. Error: Could not start test run for unit tests for Windows Store app: No valid developer license found for running unit tests for Windows Store apps. Please install/renew your developer license.. In Windows 10 this step is not required any more. You will still need to enable your device for development, though. Error: Could not start test run for unit tests for Windows Store app: Unit tests for Windows Store apps cannot be run from a service or non interactive process. Please run unit tests from an interactive process.. Put a shortcut to this file into %AppData%\Microsoft\Windows\Start Menu\Programs\Startup to make it run automatically at log on. Log off and log on to check that it works. Enable automatic logon on the build agent machine to make sure the agent starts automatically after a reboot. 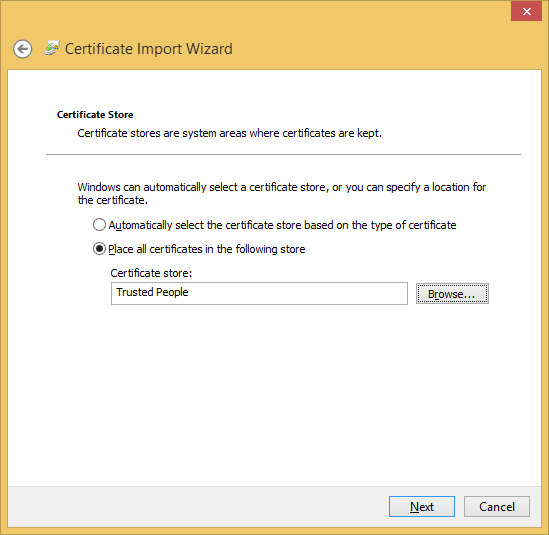 error 0x800B0109: The root certificate of the signature in the app package or bundle must be trusted..
After performing all these steps, the build agent finally successfully ran the Windows Store tests. It's quite a bit more complicated to get them running than the standard .NET unit tests.